What's in the kit? The kit includes... 1-month supply of YOGABODY® Stretch (Fleximine) - The ultimate nutritional support for yoga students, dancers, gymnasts, and other bendy-bodied people worldwide. The YOGABODY® Handbook - A complete at-home flexibility guide with a 5-day per week (15 minute per day) training program for all levels (beginner to advanced). YOGABODY® Flexibility Kit 3.0 has been added successfully to your wishlist. 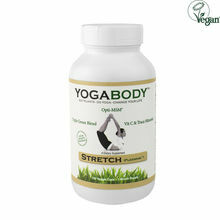 1-month supply of YOGABODY® Stretch (Fleximine) - The ultimate nutritional support for yoga students, dancers, gymnasts, and other bendy-bodied people worldwide. The YOGABODY® Handbook - A complete at-home flexibility guide with a 5-day per week (15 minute per day) training program for all levels (beginner to advanced). 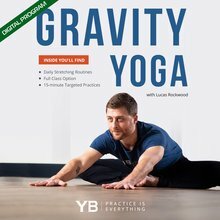 Gravity Yoga (digital product) - Membership to this program includes daily 15-minute exercises with targeted videos for different parts of the body. Along with the videos, this membership includes great stretching guides and tips perfect for every level of yoga student! I have used this product intermittently for 3 years. Particularly when I am working on a more intense regular schedule of pushing myself toward more challenging stretches and postures, I will pop two caps about two hours prior to class, and two more either that evening or next morning after. Also, if I am sore the next day after a deep stretchy class, I find this product helps relieve the muscle aches. Generally, I try to eat a healthy diet including lots of greens, potassium and calcium (I’m one of those vegetarians who occasionally eats fish, dairy & eggs.) When my schedule erodes my good eating habits, the YOGABODY product helps keep my machine running with ease and smoothness. I’m 63, and took my first yoga class at age 57. I am often quoted as saying, “When I started Yoga, I could barely reach the tops of my socks!” My forward bends are much better now. Thanks, Lucas! I have benefited as much from learning from you about what works as I have from the product itself! Namaste! I can do the splits at 47! You’ll never believe the progress in my flexibility using YOGABODY over a 2 week period. I am 47, and before now I could never do the splits. After I started using YOGABODY I am so much more flexible it’s unbelievable. These two pictures speak for themselves. In the first I am 5 inches off the ground, and the second pic is after only 6 stretching sessions! I am also not as sore after workouts and my body recovers faster with YOGABODY. I am so pleased, thank you!